Great vibrant colors, well made and affordable. Very happy with this purchase. The rugs are beautiful in design, loved the bright bold colors. BUT the are very slippery on my hardwood floors, even after applying non-slip rug guards they still slide across the floor. This is really unsafe. I have gone as far as adding double side tape to the back of the rug and they still slip, slide and bunch up. Love the colors but not impressed with the quality. Perfect rug. Just what I'd wanted for my dining room area. I bought this rug set for my grandson’s room because his carpet needs replacing. It’s not easy to find anything to satisfy this child, but these rugs did the trick! I would definitely buy again! The set of three rugs was just perfect for my house. The colors are great, along with good quality at an amazing price. I would absolutely recommend this product. Thanks Overstock.com. This is a great looking rug set. We just needed to put some non-skid pads down, and they are perfect! nice rugs but returned them because I ordered wrong size. The rugs are the colors I expected, but much thinner and smaller than I expected. Not very well made, flimsy, but I guess how inexpensive it was explains it. I love this set and would definitely recommend. I love the rugs! They go perfect with my chocolate furniture. 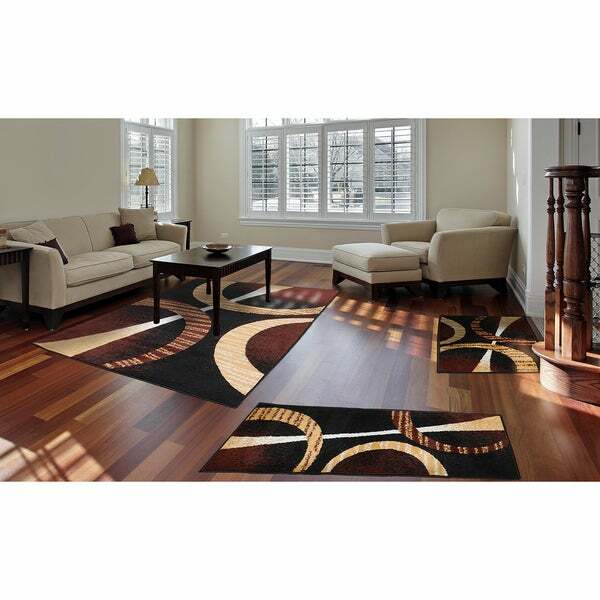 "Home Dynamix Ariana Collection Contemporary 3-Piece Area Rug (4'11"x6'11" 1'8"x4'11" 1'8"x2'8") - Black Transitional 3 Piece Set. Is the color purple or red? Picture looks purple." "This has it is available in different sizes I am needing a three piece set for sink, door, stove for the kitchen does this design come in smaller sizes"
Unfortunately, we currently do not offer this rug set in a different sizing. "do these rugs have scotch guard?" No, they do not have scotch guard.